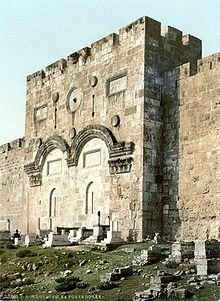 As one begins to study the gates of Jerusalem it must be kept in mind the gates as we have them today were, for the most part, built or renovated by the Ottomans in the 1500's AD. However, these gates, as will be seen, were in some cases built upon the foundations of earlier gates, perhaps dating back to the days of Nehemiah and Solomon. Other gates exist as well. Gates such as the Huldah Gate, Double Gates, Triple Gates, the Single Gate are lesser known of the gates of Jerusalem. The Sheep Gate is mentioned in the New Testament. 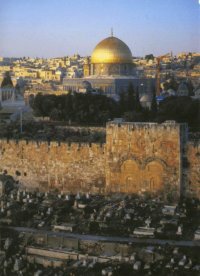 Remarkably, like everything else in this mysterious city, a look at the gates of Jerusalem also provides a peek into the history of religion, God, and in many ways mankind itself over the last thousands of years. The face of Jerusalem has changed radically over the millennia. Jerusalem history is littered with wars and destruction, followed by rebuilding and restoration. The gates of Jerusalem today bear the bullet holes from 20th century conflict in Jerusalem. These gates mark the entrance and exit ways into what is known as the Old city. This area is home to the Armenian, Muslim, Christian and Jewish Quarters, and adjoined to the Temple Mount. It is the holiest area in the world, and guarded by primarily eight gates. Four of the gates of Jerusalem face the cardinal directions; the Damascus Gate to the north, the Golden Gate to the east, the Zion Gate to the south, and the Jaffa Gate to the west. The remaining gates are the Flower, or Herods Gate, the Lion Gate, the Dung Gate, and the New Gate. It quickly becomes evident as one reads about the gates of Jerusalem that each gate possessed multiple names. Not surprisingly, whichever appellation one used depends on the period in time and which religious authority was in control. Jewish, Christian and Muslim names are attributed to each gate, and each name dates from a different period of Jerusalem history. View what others have said about Jerusalem! The Jaffa Gate is named so because the road leading from this gate heads westward to the port city of Jaffa, or Joppa. The gate as it stands today was rebuilt in 1538 by the Ottoman sultan Suleiman the Great. Facing due west, the Jaffa Gate is the best known and busiest of the gates of Jerusalem. It is the only gate on the western side of the Old city. 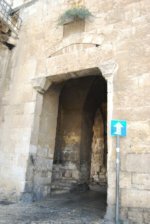 Today it is the main vehicle entry point into the Old City, and one of only two of the gates of Jerusalem that allow vehicle access. The walls nearby date to the second century B.C. and were built by the Hasmonean rulers of the era. Just inside the Jaffa Gate a structure has been identified dating back to Herodian Jerusalem. This structure is believed to be a foundation of a defensive tower Herod built for his palace. It is one of the very few remains from this glorious epoch in Jerusalem history. It, along with the Western (Wailing) Wall and other palace foundations are some of the significant finds dating from Herod's rule of Jerusalem. Herod built three towers, which he named the Hippicus, Phasael and Mariamme adjoined to the western section of the walls in 37 - 34 B.C. One of these towers, now known as the Tower of David, stands today just inside the Jaffa Gate. It is the highest point in the Old city, and the gate was originally built to defend and protect the approach from the west. The Tower of David is the dominating feature near the Jaffa Gate. Also near Herod's Palace, just inside the Jaffa Gate, is the Praetorium. The Praetorium was a rasied platform from which the Roman procurator held court. It was located outside Herod's Citadel, near the Jaffa Gate. Some believe this is where Pontius Pilate may have confronted Jesus in Jerusalem , though this too is debatable. Regardless, this is a very old site within the precincts of Jerusalem. It is quite likely the Jaffa Gate and its surroundings have been used since before the second century B.C. as one of the primary areas and gates of Jerusalem. The first wall ran east from Herod's Towers at the Jaffa Gate to the enclosure walls of the Temple. It, like the other gates of Jerusalem, is known by many different names. The Arabic name is Bab el-Halil. Bab el-Halil translates as the Gate of the Beloved. It is also known in the Arab world as the Gate of Hebron. The Beloved is, of course, Abraham, the beloved friend of God and great patriarch of the Muslim, Christian and Jewish faiths. If one exits the gate and takes a left, he will travel along the Patriarchal Highway eventually reaching Hebron, the burial site of Abraham . Today, Hebron is a city caught in the crossfires of Middle East conflict. It has also been called the Chevron Gate, as the road from this gate leads to Chevron as well. It has also been called the Gate of the Friend, and the Gate of David's Prayer Shrine. 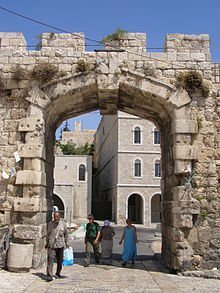 Porta Davidi, the Gate of David, is yet another appellation for the Jaffa Gate. The gates of Jerusalem can quickly become a confusing conglomerate of names. Located above the Hinnom Valley, or Gehenna Valley (Valley of Hell), it was the main entrance into the Old city until 1948. The Roman army camped on the site in 70 AD as they laid siege to Jerusalem. They would eventually destroy the city and the Temple, burning, murdering and looting at will. The site was an Arab fortress in 638 AD. Godfrey of Buillon took up positions near the Jaffa Gate as the Crusaders conquered Jerusalem in 1099 AD. The Crusaders proceeded to rebuild much of the Old City, including the Jaffa Gate. However, these walls and the gates of Jerusalem were destroyed by the Muslim leader Saladin in 1187 AD. Suleiman rebuilt the walls and many of the gates of Jerusalem as they stand today in 1538 AD. Above the Jaffa Gate is a stone plate which commemorates the date of construction and its Ottoman builders. Each of the gates of Jerusalem has a unique or distinctive quality or feature about it. The Jaffa Gate's distinctive characteristic is a small sphere on each side of the arch. Two graves are located inside the Jaffa Gate. Many believe them to be the graves of the architects hired by Suleiman, although some dispute this. Like many of the gates of Jerusalem it has an L-shaped internal structure. The gate is constructed of large, hewn, sand-colored bricks and the entry is about twenty feet in height. The wall rises another twenty feet above the gate. The Jaffa Gate was strategically built on an angle. The gate was built at a right angle with the wall as a defensive measure. Just inside the Jaffa Gate is David street. As you enter, to the left is the Christian Quarter, to the right the Armenian Quarter, and straight ahead lie the Muslim Quarter. A square is located across the street from the nearby Tower of David. In times past wheat and other goods and merchandise were sold in this square. During the Crusader conquest of Jerusalem in 1099 AD, Moslem defenders and their wives and children sought refuge and protection inside the Tower of David. The main road from the Jaffa Gate runs between the northern hill of the Acra and the southern hill Mount Zion. It leads eastward into the city down into the Tyropeon Valley. The Jaffa Gate has taken on a role as well during the modern era, as have the other gates of Jerusalem. In the middle to late 1800's Jerusalem exploded in tourism and population. The Jaffa Gate benefitted greatly from the many new tourists. The King David Hotel was built nearby. Bathsheba's Pool, where many believed the king to have encountered Bathsheba bathing, was nearby and attracted many pilgrims. Beheadings also took place just inside the Jaffa Gate during the bloody 1860's. Jerusalem's holy past cannot hide its bloody footprints. In 1898 an opening was built into the wall near the Jaffa Gate. This wide passage was built between the gate and the Citadel in order to allow the German Kaiser Wilhelm II to enter Jerusalem without dismounting his horse. In the early 1900's Pasha, the tyrant of Jerusalem, staged hangings near the Jaffa Gate to coincide with the dismissal of Friday Prayers so that large audiences would see the dead bodies. In 1907 a clock tower was built on top of the Jaffa Gate to honor 25 years of rule by the Ottoman Sultan Abdul Hammid II. It was built of limestone and stood thirteen feet tall. It consisted of four clock faces, each facing the four cardinal points north, south, east and west. The East and West faces kept European time, while the North and South faces kept local time. The clock was destroyed by the British in 1922. 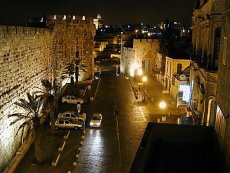 Up until the end of the 19th century AD the Jaffa Gate was locked each night. This was done in order to keep out marauders, bandits and thieves, as well as jackals, hyenas, and other unwanted invaders. Travelers at dusk carried lanterns to identify themselves, and those unlucky arrivals after dark were force to sleep outside the city gate. The gate was reopened at dawn. It was through the Jaffa Gate the mayor of Jerusalem exited the city seeking out the British army in order to surrender the city. On December 9, 1917 Brigadier General CF Watson and Lt. Colonel H Bailey entered Jerusalem with the mayor through the 1898 opening near the Jaffa Gate used by the Kaiser. Two days later, the British General Allenby entered, on foot, through the Jaffa Gate, deliberately ignoring the German Kaiser's opening, and accepted the surrender of Jerusalem to the British. General Allenby chose the Jaffa Gate because it was one of four major gates of Jerusalem. Some have suggested his first choice would have been the Golden Gate, however, this required walking through a Muslim cemetery, thus Allenby chose the Jaffa Gate as his point of entrance. Accompanying him was Major T.E. Lawrence, who is better known by his later name Lawrence of Arabia. In the years between 1914 - 1917 the many cafes and shops near the Jaffa Gate witnessed much discussion and debate about the future of Jerusalem. These were dire times, as the population of Jerusalem from 1914 - 1917 shrank from 85,000 to 55,000 residents. With the British occupation in 1917, Jerusalem became a part of the British Empire and fell under British law. British rule was interrupted briefly in 1938. As the Brits pandered to Hitler with the Munich Agreement in September of 1938, rebels were inspired to storm the Old City and drive out the British on October 17 of the same year. On October 19th, the British army stormed the Jaffa Gate and the other gates of Jerusalem reclaiming full control of the Old City. Two wars in particular stand out in the modern era regarding the long history of conflict in Jerusalem. The Jaffa Gate figures prominently in both, as do each of the gates of Jerusalem. On May 17, 1948 Jewish forces launched a full frontal assault on the Jaffa Gate. The Jordanian and Arab forces, however, repelled the attack and held the gate. Israeli forces suffered heavy casualties. The 1948 War of Independence was a defining moment in not only 20th century history, but world history as well. Bullet holes near the Jaffa Gate are evidence of this struggle. The Jordanians sealed the Jaffa Gate, and would maintain control of the Old city until 1967. In the 1967 Six Day War, Israeli forces surged through the Jaffa Gate and the other gates of Jerusalem simultaneously, enroute to a victory over the Jordanian and Arab forces controlling the Old city and the Temple Mount. The Jewish Forces would meet at the Western Wall and pray for the first time in centuries. The Jaffa Gate was reopened after the Israelite victory in 1967. In 2000 Pope John Paul entered Jerusalem through the Jaffa Gate. Thus, three of the most powerful men of their time, the Kaiser in 1898, General Allenby in 1917, and the Pope in 2000 would enter the city through this portal. In the early 2000's the road straddling the gate was moved west in order to build a plaza. The plaza connects the Jaffa Gate to the modern day Mamilla Shopping Mall. In 2007 a $4 million dollar renovation project was started near the Jaffa Gate and completed in 2010. The Jaffa Gate and its walls were cleaned from accumulated car exhaust. The previously mentioned bullet holes from the '48 War of Independence were preserved as well. Also, a water aqueduct from the second and third centuries AD was uncovered. Such is the case in a city over 4,000 years old. The Jaffa Gate has been, and will continue to be, one of the four primary gates of the Old City of Jerusalem. Its strategic location, nearby artifacts and historical importance, as well as its ability to host vehicle traffic, make it also one of the most unique of the gates of Jerusalem. Another of the chief gates of Jerusalem is the Damascus Gate. This gate is as every bit unique and important as any of the other gates of Jerusalem. The Damascus Gate has its own history of people and incidents. Located on the northern side of the Old City walls this gates faces due north to Shechem and beyond to Damascus. The Damascus Gate was completed between 1537 - 1542 by the Ottoman Sultan Suleiman the Magnificent. It is the busiest, and many claim the most splendid, of the gates of Jerusalem. Markets and bazaars make this one of the busiest parts of the city on Fridays and Saturdays. Directly inside the gate is the Muslim Quarter, and the area serves as the Old City's Arab business center. It was built in a double-L fashion, similar to the Jaffa Gate and other gates of Jerusalem. It too, like the Jaffa Gate and the other gates of Jerusalem, is known by many different names. Jews call the Damascus Gate the Shechem Gate, as the road from it first leads to Shechem, then to Damascus in Syria. Each of the gates of Jerusalem possesses a unique trait. The Damascus Gate is no different. It's uniqueness is found on the walls adjoined to the gate. It is only at the Damascus Gate that the walls of Jerusalem are topped with decorative statuettes. The rest of the walls are topped with crendations, which are tooth-like projections which stick out from the tops of the walls. Outside the gate steps lead down to a wide plaza, dotted by street vendors lining the way into the Old City. The Shuk, a roofed market selling exotic goods in open stalls, lies directly inside of the Damascus Gate. The area once served as an inn for travelers, merchants and pilgrims. The gate is the largest of the gates of Jerusalem. In 2011, the Israeli government restored the gates turret and arrow slit. During the Byzantine period (324 - 638 AD) it was known as St. Stephens Gate (though another gate is also known as such). Christian tradition claims Stephen was drug out of the city through this gate and stoned on the other side of todays road, becoming the first martyr. Of the two gates of Jerusalem also names St. Stephens Gate, this is the most likely sight of Stephen's stoning. The Arabs called it Bab el-Amoud, or the Gate of the Pillar. Hence also the name the Gate of the Column. Arabs also referred to it as the Nablus Gate. It was during the Ottoman Period, stretching from 1517 - 1917 AD, that the gate became known as the Damascus Gate. During Ottoman Jerusalem it is believed that approximately seventy Dervish convents existed. These were the convents of the mystical Sufi sect of Islam. 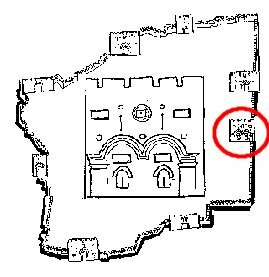 The largest of these convents was located near the Damascus Gate. Kathleen Kenyon excavated under this Turkish gate and discovered the foundations and gate of a much earlier time. Kenyon discovered a triple-arched gateway dating back to the time of the Roman emperor Hadrian, ca. 135 AD. The base of Suleiman's Damascus Gate had been built upon the foundations of Hadrian's triple-arched gate. Hadrian's gate possessed one large center entrance for royalty only, flanked on either side by two lesser entrances for commoners. Hadrian built his gate to honor the crushing defeat of the Bar-kokhba revolt. The triple-arched gate was likely not adjoined to the walls. 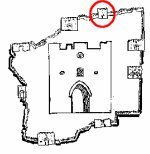 It was flanked by two towers and guardrooms. A small amphitheatre was in front of Hadrian's gate, which was called the Neapolis Gate. Just inside the gate Hadrian built a round plaza. In the center of the plaza a large pillar, or column stood. This impressive column was topped with a statue of Hadrian, thus the name the Gate of the Pillar, or Column. The column in the middle of the plaza marked the spot where Rome measured distances from Jerusalem to various points and cities in Canaan. "To the colony of Aelia Capitolina by order of the city dignitaries." The Damascus Gate rests upon the Neapolis Gate's foundation and was the only one of the gates of Jerusalem to be recognized and used in such a manner by the Romans. Hadrian attempted to erase the memory of Jerusalem from the face of the earth. This included renaming the city Aelia Capitolina and banning Jews from entering the gates of Jerusalem. Hadrian's new city, Aelia Capitolina, extended from the Damascus Gate to the Gate of the Chain, another of the lesser known gates of Jerusalem. Hadrian erected Roman statues on the Temple Mount, also erecting a Temple to Zeus. Found during a much later excavation was an inscription over the Double Gate to the Emperor Titus. The inscription was originally on the base of a statue to Antonius Pius. The statue was located on the Temple Mount in the days of Aelia Capitolina. Over the course of the years stones were taken from monuments, statues and other structures and used in construction on various projects. This is how the inscription to Titus, originally part of a statue on the Temple Mount, ended up upside down as part of the Double Gate. The Damascus Gate, as stated earlier, was known as the Neapolis Gate during the Roman time period of Aelia Capitolina. As the Turkish gate was built upon the ruins of Hadrian's second century gate, Hadrian too expanded an already existing gate. Hadrian built upon the gate which existed under Agrippa. Agrippa was a Roman general best known for his defeat of Marc Antony and Cleopatra at Actium. Thus, the Damascus Gate has served as one of the main gates of Jerusalem since at least the first century B.C., the time of Agrippa's rule. In 614 AD the walls of Jerusalem were breached by the Persian army under the leadership of The Wild Boar. 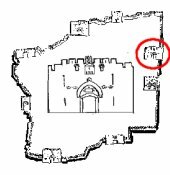 The breach took place in the northeast wall, perhaps near the Damascus Gate. The same area was breached by the Crusaders in 1099 AD on their way to victory over the Muslims. The Roman Cardo led from the Damascus Gate into the heart of Crusader Jerusalem. The Muslim leader Saladin breached the walls again in 1187 AD. 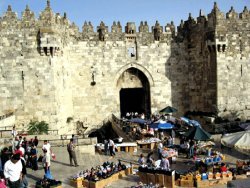 Thus the Damascus Gate and its nearby walls have undergone several phases of construction, specifically between the years of 1183-1192, and into the 12th and 13th centuries. Frederick II would much later fortify the Damascus Gate. The gates of Jerusalem have seen much action over the last two hundred years. In the later parts of the nineteenth century Arab families began to settle outside the Damascus Gate. At the same time, Jewish families settled near the Jaffa Gate. In the 1948 War of Independence Arab forces smashed through the Damascus Gate and surrounded the Jewish Quarter within the Old City. Israelite forces under Yitzhak Rabin attempted to storm the Jaffa Gate in relief of the Jewish Quarter but were turned away by the Arab forces within. Other Israeli troops broke through the Zion Gate in the south, yet were soon forced to retreat the same way they entered. However, in the 1967 Six Day War the Israeli army stormed through the Damascus Gate, while at the same time breaching the other gates of Jerusalem, hurdling through the Old City on their way to the Wailing Wall. The third of the four major gates of Jerusalem is the Zion Gate. This gate faces the cardinal direction south, and is located along the southwestern walls of the Old city. It is named such because the gate faces, and provides access, to Mount Zion. As it stands today, the gate was built by Suleiman the Magnificent in 1540. The Ottoman sultan built many of the gates of Jerusalem which stand today. It is one of the gates of Jerusalem that lead into the Jewish Quarter of the Old City. Walls near the Zion Gate date from the Hasmonean and Herodian periods of the history of Jerusalem. Similar to the previously mentioned gates of Jerusalem, the Zion Gate was built with an L-shaped internal structure. One window on each side of the gate lent its distinguishable characteristic. It, like the Jaffa Gate, can support both foot and vehicle traffic. However, vehicles are only allowed to exit through the gate, not enter. Other names of the Zion Gate are the Gate of the Prophet David, and the Gate to the Jewish Quarter. The Hebrew for the Zion Gate is Sha'ar Tzion. Muslim tradition places the tomb of king David on Mount Zion, hence the name the Gate of the Prophet David. During the Crusader conquest under Godfrey in 1099 AD, Raymond the Count of Toulouse, the richest of the Crusader commanders, led a force that laid siege to the Zion Gate. During the Ottoman Husseinis dynasty (1705 - 1794 AD), the murder of every dog in Jerusalem was ordered by the ruling authority when a single stray dog wandered onto the Temple Mount. Further cruelty and insult was added when every Jew and Christian in the city was ordered to bring dead stray dogs to a collection point at the Zion Gate. As this was one of the gates of Jerusalem which led into the Jewish Quarter, certain responsibilities fell to the Jewish community. 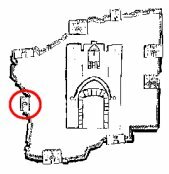 A fifteenth century traveler recorded that a certain Jewish family within the Jewish Quarter held the key to the Zion Gate. A Jewish watchman was in charge of opening and closing the gate each morning and night. At 8:45 a.m. on December 9, 1917 British forces closed on the Zion Gate. At the same time German forces were withdrawing from various of the gates of Jerusalem. In an interesting twist of fate, the day was also the first day of Hannukah, the Jewish festival of lights celebrating the Maccabean revolt and liberation of Jerusalem. 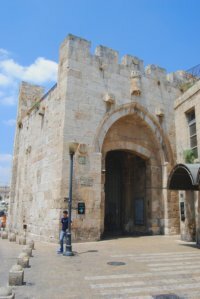 The Zion Gate would continue to see its share of historical events in the twentieth century, as would the other gates of Jerusalem. In February of 1948 Arab forces blocked off the Zion Gate, cutting off access to the New City. This was done in direct violation of an earlier United Nations Security Council declaration that the Old City was to remain an open, demilitarized zone. The UN has always taken anti-Jewish stances on such matters, and was as ineffective an organization at its inception as it is in its current inept and powerless state. On May 17th the Harel Brigade of the Palmach, an elite Jewish fighting force, launched an attack on the Zion Gate, breaking through two days later. This would not prove to be enough, however. On May 28, two rabbis exited the Zion Gate holding white flags of surrender. The Jewish Quarter had surrendered to the Arab forces. The Zion Gate would remain closed and under Jordanian guard from 1948 to 1967. However, during the Six Day War of 1967, Israeli troops erupted through the Zion Gate, dashing through the Armenian Quarter on their way to the Jewish Quarter. At the same time Israelite forces flooded through the other gates of Jerusalem converging on the Wall. A plague rests above the Zion Gate today commemorating its role in the Six Day War and liberation of the Old City of Jerusalem. The Zion Gate was renovated by Israeli authorities in 2008. However, bullet holes bearing evidence of its participation in the 1948 War of Independence were preserved. The Zion Gate certainly has its unique place within the order of the gates of Jerusalem and overall history of the ancient city. Perhaps the most intriguing of the gates of Jerusalem faces the cardinal direction of the rising sun, East. East was the direction the Jewish Temple faced and opened up to. The Golden Gate was located along the eastern walls of Jerusalem, facing east towards the Kidron Valley and Mount of Olives. It is the closest of the gates of Jerusalem to the Temple Mount, and as such would take on special significance throughout the history of Jerusalem. The Golden Gate is the oldest of the gates of Jerusalem, with its exact timeline debated by scholars and archaeologists. Scholars debate whether the gate, in its present form, was built in the 6th or 7th century AD, and whether the architects were the last of the Byzantine emperors, or the first of the Arab conquerors, perhaps the Ummayid caliphs. Some believe the Golden Gate may have been built in 520 AD as part of Justinian I's building projects in Jerusalem. Like the other gates of Jerusalem, the Golden Gate is known by a number of different names. The Christian name is The Golden Gate. In Hebrew it is Sha'ar Harahamim, or the Gate of Mercy. The Arabs call it The Gate of Eternal Life, for reasons soon to be discussed. This gate is believed by many to have been built on top of remains from the East Gate of Solomon's First Temple, and from Nehemiah's rebuilt Jerusalem, and of Herodian Jerusalem in the Second Temple period. The gate has been in its present form since at least ca. 630 AD, when the Byzantine Emperor Heraclius entered Jerusalem via the Golden Gate. It is said Heraclius entered the Golden Gate with remains of the true Cross, recovered from the Persians and placed in the Church of the Holy Sepulchre. The Golden Gate actually has two doorways. The southern gate is called the Gate of Mery. The northern gate is the Gate of Repentance. Double-arched doorways supported by wide columns characterize the Golden Gate. A unique feature compared to the other gates of Jerusalem are the two massive pillars which stand within the gatehouse of the Golden Gate. Muslim tradition claims these pillars were given to Solomon as a gift from the Queen of Sheba. Another unique aspect of the Golden Gate is that it is sealed shut. Monolithic stones in the walls nearby date back to the time of Nehemiah. In fact, Josephus states in his volume titled Wars, that the eastern wall is the only wall that king Herod did not rebuild during his massive construction projects and building of the Second Temple. This is a fascinating bit of information, for in 1969 a remarkable discovery was made only to be buried by the Muslim authorities and forgotten. In 1969 James Fleming, an Israeli archaeologist, was standing in front of the Golden Gate both studying and admiring its remarkable beauty. Suddenly the ground collapsed underneath him. Rattled but unhurt, Fleming gathered his wits as he realized he had fallen into a sinkhole. Astonished, Fleming found himself gazing at five large, wedge-shaped stones set into a massive arch. This structure was underneath the Golden Gate and adjoining walls. Unfortunately, before Fleming could further investigate the Muslim authorities sealed the hole and poured concrete over the opening. Fleming had discovered an ancient gate underneath the Golden Gate. Many scholars believe Fleming's gate may actually date from the time of king Solomon and the First Temple period! Or, perhaps, at least date from the time of Nehemiah. 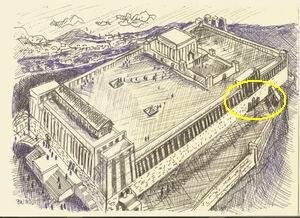 Based on the trend to build gates on top of previous gates, as seen with both Hadrian and Suleiman, it is not unlikely the gate underneath the Golden Gate was Nehemiah's East Gate mentioned in Nehemiah 3:29. "After them Zadok the son of Immer carried out repairs in front of his house. And after him Shemaiah the son of Shecaniah, the keeper of the East Gate, carried out repairs." Nehemiah's construction took place in the 5th century B.C., when Jews answered Cyrus' decree to return and rebuild Jerusalem. Nehemiah's East Gate was called Shushan, or Susa, after the Persian capital city. The Shushan Gate's construction was financed by the Jewish community in Persia. It was destroyed by the Romans during their siege of Jerusalem in 70 AD. Thus, it is not stretching to hypothesize that Nehemiah built the Shushan Gate upon the foundations of an earlier gate Solomon built along with the First Temple. Fleming may have uncovered structures that can absolutely verify the authenticity of Solomon and his First Temple constructed to honor the God of Israel! It is no wonder the Muslim authorities were so quick to close the pit and cement over its opening. In II Chronicles 31:14 the Bible speaks of an eastern gate during the reign of Hezekiah. "And Kore the son of Imnah the Levite, the Keeper of the eastern gate..."
Biblical Arhaeologial Review (BAR) printed an article by Asher Kaufman in which the author argues that the First and Second Temples were built in the immediate vicinity of the Dome of the Rock. Thus it is possible the East Gate of the First Temple, and the Shushah Gate spoken of by Nehemiah, were likely located within the vicinity of the current Golden Gate. Fleming's buried gate certainly takes front stage as the most probable candidate for the East Gate of the First and Second Temple periods. The gate is steeped in religious tradition more so than any of the other gates of Jerusalem. The prophet Ezekiel had much to say about the East Gate. 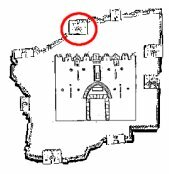 This gate, according to Ezekiel, is the Lord's gate thus separating it from the other gates of Jerusalem in its significance. 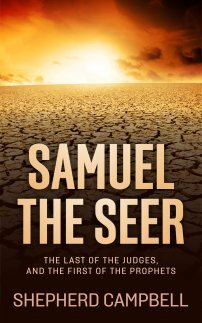 Ezekiel describes in-depth the vision God gave him on the banks of the Chebar River. In this vision Ezekiel saw the glory of the Lord departing Israel through the eastern gate. Ezekiel 10:18-19 speaks of the glory of the Lord. "Then the glory of the Lord departed from the threshold of the temple and stood over the cherubim. When the cherubim departed, they lifted their wings and rose up from the earth in my sight with the wheels beside them; and they stood still at the entrance of the east gate of the Lord's house. And the glory of the God of Israel hovered over them." Again in Ezekiel 11:22-23 Ezekiel speaks of the Lord departing Jerusalem in the east. "Then the cherubim lifted up their wings and the wheels beside them, and the glory of the God of Israel hovered over them. And the glory of the Lord went up from the midst of the city, and stood over the mountain which is east of the city." The Golden Gate also holds a special place in regards to the future of Jerusalem. Whereas the other gates of Jerusalem are mentioned as simply being rebuilt in the New Jerusalem, the Golden Gate takes an active role in ushering in the New Heaven and New Earth. Again, we can turn to the prophet Ezekiel for a description of these end days. Ezekiel 43:1-2, 4-5 describes the return of God's glory to Jerusalem from the same direction He once departed, the east. "Then he led me toward the gate, the gate facing toward the east; and behold, the glory of the God of Israel was coming from the way of the east. And His voice was like the sound of many waters; and the earth shone with His glory...And the glory of the Lord came into the house by the way of the gate facing toward the east. And the Spirit lifted me up and brought me into the inner court; and behold, the glory of the Lord filled the house." Ezekiel 44:1-3 is even more clear on the role of this eastern gate in the upcoming days. "Then He brought me back by the way of the outer gate of the sanctuary, which faces the east; and it was shut. And the Lord said to me, 'This gate shall be shut; it shall not be opened, and no one shall enter by it, for the Lord God of Israel has entered by it; therefore it shall be shut. As for the Prince, he shall sit in it as prince to eat bread before the Lord; he shall enter by way of the porch of the gate, and shall go out by the same way.' "
In other words, the Prince who is the One to Come shall one day enter Jerusalem through this eastern gate, which is to be shut until that time. The Messiah will return to rule over Jerusalem and the world by entering the city from the direction of the Mountain of Olives, and entering through the shut eastern gate. 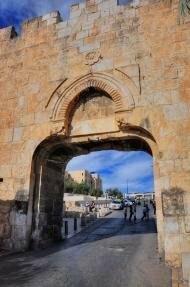 Interestingly enough, the Golden Gate is the only sealed gate of the Old City of Jerusalem, and has been that way for nearly five hundred years. To the Jew, the Golden Gate was to be the sight of the Messiah's return to establish His kingdom on earth; and free the Jewish people from the nations of the world. The Golden Gate was to be the entry point for the Jewish Messiah into Jerusalem. Christian tradition places the Golden Gate as the site of the Triumphal Entry by Jesus into Jerusalem. By entering the eastern gate Jesus knew all too well what He was doing. As stated in Ezekiel, and believed by Jews of Jesus' time and today, the Messiah would return to rule Jerusalem through the East Gate. Mark 11 captures the Triumphal Entry of Jesus into Jerusalem. "And those who went before, and those who followed after, were crying out, 'Hosanna! Blessed is He who comes in the name of the Lord; Blessed is the coming kingdom of our father David; Hosanna in the highest!" Thus, when Jesus performed His Triumphal Entry He was proclaiming Himself as Messiah by entering Jerusalem from the east. He fulfilled the passage in Ezekiel about the Prince returning and entering by the eastern gate. This bold and daring move on His part set the stage for the showdown with the scribes and Pharisees, led to His arrest and ultimately to His crucifixion. Thus Christian tradition placed the Triumphal Entry by way of the Golden Gate. It is a tantalizing thought to think Fleming's buried gate may also be the gate through which Jesus passed the week before His death and resurrection. Suleiman the Magnificent was determined to thwart the Jewish tradition of the Messiah returning via the Golden Gate. 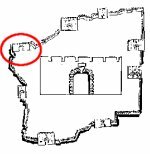 Thus in 1540-41 AD he sealed the gate shut. Moslem tradition places the resurrection in the end days occurring in front of the eastern gate. Consequently, a Muslim cemetery was also built in front of the Golden Gate, which stands today. It was this cemetery which Allenby refused to pass through, thus he entered Jerusalem via the Jaffa Gate instead. This cemetery, coupled with the gate being sealed shut, were Islamic attempts to dissuade the Messiah from returning to Jerusalem. Adherents to Islam, Judaism and Christianity all desire to be buried here. As a result, cemeteries dominate the immediate vicinity surrounding the Golden Gate. Jew and Christian are buried side by side with the Muslim, all in hopes of getting a front row seat to the resurrection. Cemeteries dot the nearby Kidron Valley, and blanket the slopes of the Mount of Olives. To the Jew and Christian, it is the site of Messiah's appearance. To the Muslim, Allah's final judgement takes place at the Golden Gate. Below is an excerpt from Simon Sebag Montefiore's excellent book entitled, Jerusalem. In it he describes the Islamic view of the final judgement and the role of the Golden Gate. This gate, undoubtebly, stands as the most religiously charged of the gates of Jerusalem. "The Muslims created a geography of Apocalypse around Jerusalem. The forces of evil perish at the Golden Gate. The Mahdi - the Chosen - dies when the Ark of the Covenant is placed before him. At the sight of the Ark, the Jews convert to Islam. The Kaaba of Mecca comes to Jerusalem with all those who ever made pilgrimmage to Mecca. Heaven descends on the Temple Mount with Hell in the Valley of Hinnom. The people assemble outside the Golden Gate on the Plain- al-Sahira. Israfil the Archangle of Death blows his trumpet; the dead (especially those buried around the Golden Gate) are resurrected and pass through the gate, the portal to the End of Days..."
It is also a possibility that the Golden Gate is the same as the Beautiful Gate mentioned in Acts 3:2,10. "And a certain man who had been lame from his mother's womb was being carried along, whom they used to set down every day at the gate of the temple which is called Beautiful...and they were taking note of him as being the one who used to sit at the Beautiful Gate of the temple to beg alms..."
BAR ran an article in which they argued Jerome may have mistranslated the Greek text as he wrote the Latin Vulgate. It was from the Latin Vulgate that the King James Bible, the first English version, was translated. The Latin Vulgate read "Golden Gate", whereas the Greek New Testament read "Beautiful Gate". It is plain the Golden Gate holds special significance for Muslims, Christians and Jews. During the Fatimid period stretching from 969 - 1099 AD, Paltiel, a Jewish doctor, secured the right for Jews to pray at the Golden Gate. During the Crusader years between 1131 - 1142 AD a procession was led through the Golden Gate every July 15 to commemorate the Emperor Heraclius entrance in 630 AD. This ceremony was known as the Elevation of the Holy Cross. The Elevation of the Holy Cross celebrated the return of the True Cross to the Church of the Holy Sepulchre by Heraclius. Supposedly the two gates of the Golden Gate align precisely with the tomb of the Church of the Holy Sepulchre. The Crusaders opened the Golden Gate twice a year. Once for the ceremony of the Elevation of the Holy Cross, and the second time being to celebrate Easter and Christ's Triumphal Entry through the East Gate. Dead Crusaders were buried in the nearby Cemetery of the Lion, ironically alongside Muslim warriors. After the Crusader defeat by Saladin in 1187 AD the Golden Gate was closed. Suleiman then sealed it shut some two and half centuries later. Today, access to the gate remains restricted. However, the Golden Gate remains as one of the most interesting and mysterious of the gates of Jerusalem, with still more secrets left to be uncovered. Herods Gate was named so because it was once believed to have led to a structure erroneously identified by Christians as king Herod's Palace. The Jewish and Muslims know the gate as the Flower Gate. This name derives from the floral designs in its architecture. 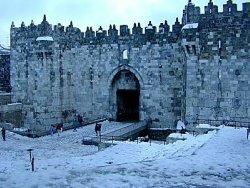 It is located in the northern wall, to the east of the Damascus Gate. Herods Gate leads into the Muslim Quarter and is one of the newest gates of Jerusalem. The gate as it stands today was built in 1875. During the years of Suleiman it was a small wicket opening, hardly a gate at all. Its main purpose, pre-1875, was to relieve the flow of traffic in the northern part of the city. During construction in 1875 the gate was closed. Herods Gate was built with an internal L-shaped structure, like many of the other gates of Jerusalem. It sits 755 meters above sea-level. Other names include Sha-ar Haprahim, the Hebrew equivalent of the Flower Gate. It is also known as the Sheep Gate. This appellation stems from the weekly sheep market which used to be held in the plaza outside the gate. The Muslims called it Bab a-Sahairad, or the Cemetery Gate. This name takes its root from the Moslem Cemetery which rests outside the modern gate on a nearby hilltop. The area has long been associated with the weakest part of Jerusalem's defenses. The great Crusader Godfrey of Bouillon exploited the weakest part of the Muslim defense just east of Herods Gate during the Crusader victory in 1099. In 1998 excavations near the eastern parts of the Flower Gate uncovered 9 archaeological layers. Structures were found dating back to the Second Temple Period of Herodian Jerusalem. An intact segment of a Roman-Byzantine era wall was also uncovered. 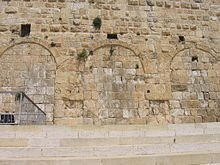 Though the gate today is a newer gate, the wicket opening and surrounding walls reach back to at least the time of Herod, including the time period of Jesus in Jerusalem. The Lions Gate is the eastern entrance into the Old City of Jerusalem. This gate, like many of the gates of Jerusalem, was built by the Ottomans in 1538-39 AD along the same stretch of walls as the Golden Gate. As mentioned above, the Ottomans also sealed the Golden Gate shut. The Lions Gate also faces the Kidron Valley and Mount of Olives. The gate was originally built with an L-shaped structure, similar to the other Ottoman gates of Jerusalem. However, this L-shaped structure was later altered in order to allow vehicle access. The gate was tabbed St. Stephen's Gate as well, though the Damascus Gate is the likeliest site of Stephen's martyrdom. 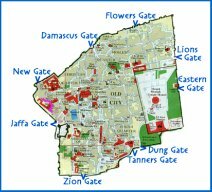 Other names of the Lions Gate include The Gate of Jehoshafat, in Arabic Bab sitt Miriam, the Gate of the Tribes, and St. Anna's Gate. Muslim tradition holds that the virgin Mary was born inside the gatehouse. Hence the name Bab sitt Miriam, which translates in English as The Gate of Mary. As one enters the gate, the road to St. Anna is on the right, thus the name St. Anna's Gate. In Hebrew the gate is called Sha'ar Ha'araiot, which also translates as the Gate of the Lions. The Lion is the symbol of Jerusalem. In Genesis 49:9 Jacob compares his son Judah to a lion. The Tribe of Judah became the royal tribe of Jerusalem with the ascension of David to the throne ca 1000 B.C. Thus, the lion became the symbol for the tribe of Judah, and eventually all of Jerusalem. Jerusalem was the Southern Kingdom's capital city. Four lions decorate the facade of the gate lending the gate its name. These lions were said to have been built by Suleiman under the influence of a dream. The legend goes that Suleiman had desired to punish the Jews of Jerusalem. However, he had a dream in which he was devoured by lions, thus his mind was swayed. Instead, he built the Lions Gate adding the lions to commemorate the occasion. Yet another legend credits the lions as being built to honor the Mameluke Sultan Baibars. Baibars was known as "The Lion of Egypt and Syria". In the years spanning 1223 - 1277 AD Baibars defeated the Crusaders and the Mongols enroute to conquering all of the Middle East. Still others claim the lions are not lions at all, but rather leopards. Some claim them to be panthers. As with just about everything in Jerusalem, agreement is hard to come by. As one enters The Lions Gate he finds himself on Lions Gate Road. The gate also leads to the Via Dolorosa. The northern edge of the Temple Mount is on the left hand side, and the road to St. Anna's is on the right. The Pools of Bethesda are also nearby. Here the apostle John portrayed Jesus as healing a paralytic man. On Easter the Christians set out in a procession from the Lions Gate along the Via Dolorosa. During the Six Day War of 1967 Israeli paratroopers from the 55th Paratrooper Brigade entered the city through the Lions Gate. Simultaneously, Israeli forces flooded through the other gates of Jerusalem as they all converged on the Western Wall. The Old City of Jerusalem was back in Israelite hands and the gates of Jerusalem were now under full Jewish control. Of all the gates of Jerusalem, unquestionably the most interesting name belongs to the Dung Gate, and for obvious reasons. The Dung Gate is the smallest of the gates of Jerusalem, possessing the lowest archway and built into the south walls. The present gate was built by Suleiman, along with most of the other gates of Jerusalem, around 1538 AD. The Dung Gate only allows foot traffic. It derives its name from the fact that refuse and ash were escorted out of the city through this gate and dumped in the Hinnom Valley. The Dung Gate was a gate for trash from not only the Old City but the Temple Mount as well. In fact, the Dung Gate is the closest gate to the Western Wall. Today it stands as the main entrance to the Western Wall. Other names of the gate include the Gate of Silwan, after the nearby Silwani village and its villagers that regularly use the gate. The Dung Gate has also been called The Gate of Moors, after the 16th century North African immigrant neighborhood located next to the gate. It has also been called the Mograbi Gate after the Mograbi-Arab Quarter nearby. A distinctive feature of the Dung Gate are the two triangles engraved in the stone artwork. The Gate is also topped by an engraved flower. The modern day Dung Gate faces the Kidron Valley close to the Gihon Spring. The original Dung Gate existed also on the south walls, however closer to the Kidron Valley than the present day gate. An Islamic tradition from around 638 AD claims the name originated during the Omar's conquest, when trash and refuse from the city were removed through the gate. However, Jewish traditions from as early as the second century AD and before attest to the use of the Dung Gate to remove trash and Temple ash from the Old City. The Dung Gate has been in use since the First Temple Period, during the days of king Solomon in the tenth century B.C. 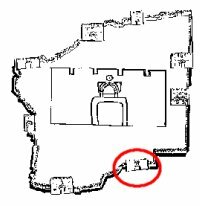 The First Temple Dung Gate was southeast of the current gate, on the walls of the City of David. This makes the Dung Gate the oldest of the gates of Jerusalem still in use, though in a slightly modified location. Nehemiah makes an interesting comment on the Dung Gate in Nehemiah 2:13. "So I went out at night by the Valley Gate in the direction of the Dragon's Well and on to the Refuse Gate, inspecting the walls of Jerusalem which were broken down and its gates which were consumed by fire." The Refuse Gate literally translates as Gate of Ash-heaps. Ash from the Temple incense was collected and eventually thrown away. What is interesting is that the gate was in a state of disrepair. Thus, things had not been touched since the destruction of the First Temple by the Babylonians in 586 B.C. The Dung Gate was rebuilt by Nehemiah. During the days of Nehemiah the Dung Gate was repaired by an individual named Malchijah, the son of Rechab. His exploit is recorded in Nehemiah 3:14. "And Malchijah the son of Rechab, the official of the district of Beth-haccherem repaired the Refuse Gate. He built and hung its doors with its bolts and its bars." The Dung Gate during the Second Temple Period (538 B.c. - 70 AD) was located near the Siloam Pool, which provided water for the city via a network of tunnels and shafts. Trash was thrown from the Dung Gate into the Hinnom Valley below. The earlier Dung Gates of the previous two Temple periods were within close vicinity to the gate today. Each gate has been used for the same purpose - the disposal of trash and refuse from the city dumped into the Hinnom Valley below. As mentioned with the previous gates of Jerusalem, the last two hundred or so years have witnessed a lot of conflict in Jerusalem. The Peasant Revolt took place in 1834, during the Albanian conquest which stretched the decade from 1830-1840. The Dung Gate played a significant role in the revolt. Villagers from the nearby Silwan village opened the Dung Gate for rebel forces, after showing them a hidden tunnel. The rebels pinned the Egyptian forces inside the citadel for a short, but bloody, five days. During the 1948 War of Independence, the Jordanian army controlled the Dung Gate. They widened the gate in 1952 to allow for vehicle traffic. Today, another gate stands nearby the Dung Gate. This gate, however, was built in medieval times and is called The Tanner's Gate. During the Six Day War of 1967 the Jerusalem Brigade smashed through the Dung Gate and the Zion Gate simultaneously and headed for the Western Wall. The other gates of Jerusalem surrounding the Old City were taken in similar fashion as Israel recaptured the Old City of Jerusalem. The Six Day War came to end with three different companies of Israeli Defense Forces converging together at the Wailing Wall. As the Israelites occupied the Old City, the Dung Gate was intentionally left unguarded, allowing many of the Jordanian soldiers that abandoned their positions to exit through the Dung Gate. The New Gate is one of the newer gates of Jerusalem, built in 1889 with the permission of the the Turkish Sultan Abdul Hammid II. Thus the Sultan provided its alternative name of The Gate of Hammid. The New Gate is located in the northwest corner of the city. This is the only one of the gates of Jerusalem which leads to the Christian Quarter, located immediately within. The Gate was built to allow easy access from the many Christian monasteries outside the walls to the Christian Quarter within. Thus, the French ambassador in Turkey asked the Sultan Abdul Hammid II if he would consider building a gate to bridge the two communities. The Sultan kindly agreed, and yet another of the gates of Jerusalem surrounding the Old City was built. The New Gate is the simplest and least adorned of the gates of Jerusalem. Its distinctive feature is found in the crenelated stonework which surrounds the arched doorway. 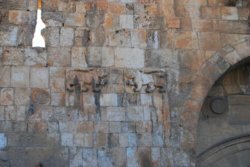 A shield of David is also embedded in the wall of the gate. Different sources suggest a previous gate existed either where the New Gate is currently, or in the nearby vicinity. 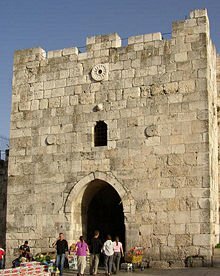 However, depending on which article or source one reads, this older gate was sealed following Saladin's capture of Jerusalem in 1187, or by Suleiman the Magnificent in 1516 AD. In the 1920s and '30s the New Gate had a iron gate operated by the Police. It saw much action during the 1948 War of Independence. Israeli soldiers breached the Old City of Jerusalem through this gate and established a bridge-head. However, their advance was short-lived, as the Jordanian and Arab forces forced their retreat back through the New Gate. As the Old City remained in Jordanian control after 1948 the gate found itself the border between Jordan and Israel, called No Man's Land. The Jordanians closed the gate, and it remained closed until the Six Day War in 1967. Today, the New Gate is maintained by the Israeli Antiquities Authority. The land nearby and surrounding the gate is owned by the Latin Patriarchs and the Franciscan Order. 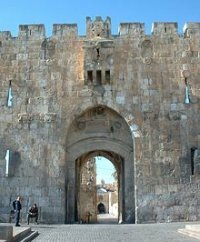 The Huldah Gates of Jerusalem consist of a set of two separate gates, both located in the southern wall of the Old City of Jerusalem. Both of these gates are now sealed shut. The exact date of construction is unknown, however The Triple Gate believed to have originated during the Herodian period. The western gate is a double-arched gateway called The Double Gate. The eastern gate is a triple-arched gateway named The Triple Gate. The origin of the name Huldah is debated. It comes from the Mishnah's description of the Temple Mount, yet from where or who the Mishnah took it remains a debate. 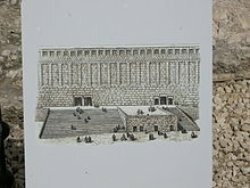 Most scholars agree the term Huldah in the Mishnah describes the sanctified area of the Temple Mount during the Hasmonean period. However, the etymology of the name is a mystery. The most interesting opinion amongst scholars is that the name derives from the First Temple period prophetess, Huldah. II Kings 22:14-20 describes her presence on the Temple Mount. Verse 14 speaks of her residence in Jerusalem. "So Hilkiah the priest, Ahikam, Achbor, Shaphan, and Asaiah went to Huldah the prophetess, the wife of Shallum the son of Tikvah, the son of Harhas, keeper of the wardrobe (now she lived in Jerusalem in the Second Quarter); and they spoke to her." 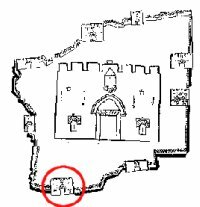 Some believe Huldah held court in the area near the Huldah Gates, hence the name, and in fact many place her tomb nearby as well. The Triple Gate pre-dates the Ottoman period, and thus the gates of Jerusalem built by the Ottomans. However, the exact date of its construction, as stated above, is unknown. Many believe the gate originates from the Herodian period of ancient Jerusalem. It is located on the south wall and possesses three arches. The Triple Gate is one of four gates of Jerusalem which is sealed shut. 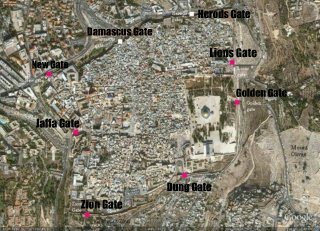 Though stated above that The Double Gate is part of what is known as the Huldah Gates, its date of construction is unknown. Some sources may suggest it was constructed during Herodian Jerusalem, however, evidence exists which clearly states otherwise. A piece of stone used in the construction of The Double Gate, located on the top part above the gate, contained an inscription to the Roman Emperor Titus. As stated previously in the article, stones were often taken from existing buildings and used in construction of other buildings, gates, etc. A stone from Hadrian's era was used in the construction of The Double Gate, which explains the upside-down inscription to Titus. Montefiore suggested that al-Malik and his son built The Double Gate to allow access to the Temple Mount from the south. The Double Gate, according to Montefiore, matches the Golden Gate in style and elegance. The Double Gate, too, is one of the sealed gates of Jerusalem. Though other gates of Jerusalem exist, and have existed in the past, these are the primary gates of Jerusalem in existence and use today. The Old City of Jerusalem has been constantly evolving and changing since before the days of king David. Abraham encountered the mysterious priest-king Melchizedek in, or just outside, the ancient town of Salem. Wars, sieges, destruction and rebuilding have changed the face and landscape around Jerusalem numerous times. Trash and debris collected over the millennia have filled in many of the valleys that once divided and defined the city. However, since the Ottomans of the sixteenth century, these primary gates of Jerusalem have remained unchanged. 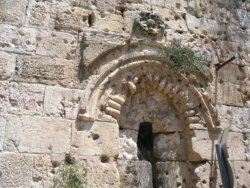 As has been shown as well, it is likely these gates were built on prior gates, perhaps even dating back to the times of Solomon, and later Nehemiah. Mysteries remain to be discovered in this holiest of city. These mysteries, for the time, remained guarded by the famous gates of Jerusalem. Have you ever visited the Holy City? Do you have pictures from Jerusalem? Share the story about your trip to Jerusalem, and post your pictures of Jerusalem and its Gates here! Then click on the link if you want to upload up to 3 more images. All images must be in .jpeg or .gif format.